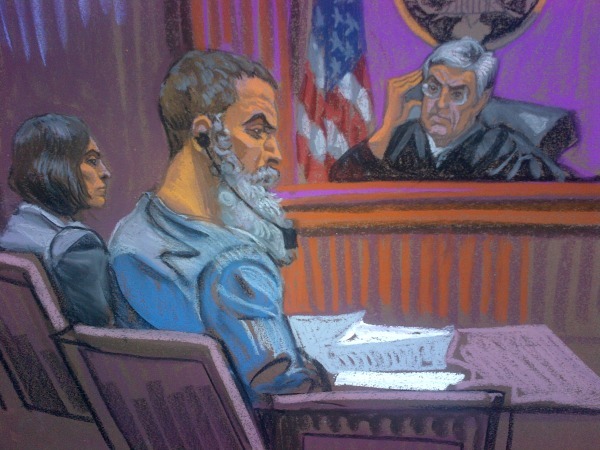 Courtroom sketch of Anas al-Libi in Federal Courthouse iin New York City on October 15, 2013. A suspected al Qaeda operative captured by U.S. special forces in Libya pleaded not guilty Tuesday in Manhattan federal court to charges that he helped plan the 1998 bombings of two American embassies in Africa. The alleged operative, Abu Anas al-Libi, 49, entered his plea via a court-appointed lawyer and then told the judge through an Arabic language translator that he cannot afford a private attorney. Prosecutors said the case — which includes charges of conspiracy to kill Americans and conspiracy to destroy U.S. defense utilities outside the country — is not eligible for the death penalty. During the brief hearing, al-Libi — who wore close-cropped hair, a beard, and gray sweatpants and a black shirt — was declared a flight risk and ordered held. He will be back in court again next week. A key al-Qaeda planner indicted for bombings of American embassies in Kenya and Tanzaniahas been brought to American soil for medical treatment, sparking outrage by some who say he should have been sent to Guantanamo Bay. NBC's Richard Engel reports. Al-Libi was whisked off the streets of Tripoli on Oct. 5 and held aboard the USS San Antonio, where he was locked in the brig and questioned without Miranda rights, U.S. officials said. Because of what U.S. officials have described as a serious medical condition — his family says it is severe hepatitis — he was taken within a week to New York, where he has been under indictment since 1998. Some Republicans in Congress said that he should have been sent to the U.S. prison at Guantanamo Bay, Cuba, for further interrogation. He is one of 21 men indicted in the bombings of the American embassies in Kenya and Tanzania, which killed more than 200 people. He is among nine in custody. Eight have been killed, including Osama bin Laden; one died awaiting trial, and three are at large. The indictment accuses al-Libi of helping plan the attacks and of conducting surveillance of the embassy and other diplomatic facilities in Nairobi, Kenya. According to testimony at an earlier embassy bombing trial, it was al-Libi, who was in London at the time of the attacks, who first proposed the bombing of foreign embassies in 1993. Richard Engel of NBC News contributed to this report.